just up the pike: mailer time . . .
mailer time . . . Some guy has been running around the blogs today pushing a site called If We Elect Ike, a less-than-flattering portrayal of Ike Leggett. I'm not going to say anything about it - I will let the voters make a decision themselves. 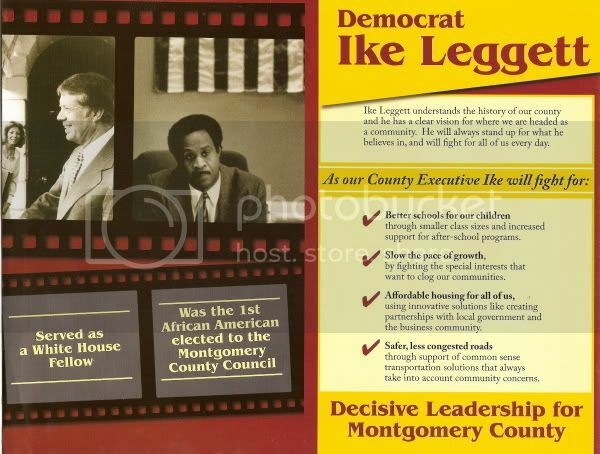 So, instead, let's take a look at the latest mailers from Ike Leggett and Steve Silverman. It's heavy on his background and light on the issues, using lines like "As our County Executive Ike will fight for . . . Safer, less congested roads through support of common sense transportation solutions that always take into account community concerns" to help persuade County residents without putting forth any concrete solutions. Steve presents a problem ("traffic"), a solution (complete with a Metro-quality map, better than the typically-seen Purple Line map) and a promise. Another political tactic - I mean, it's very easy to make promises and fail to keep them - but I feel more comfortable with Steve knowing he's actually got something to promise. What are "common sense transportation solutions"? You could ask three Montgomery County residents and they would all have different answers. It sounds like Ike Leggett wants to pander. 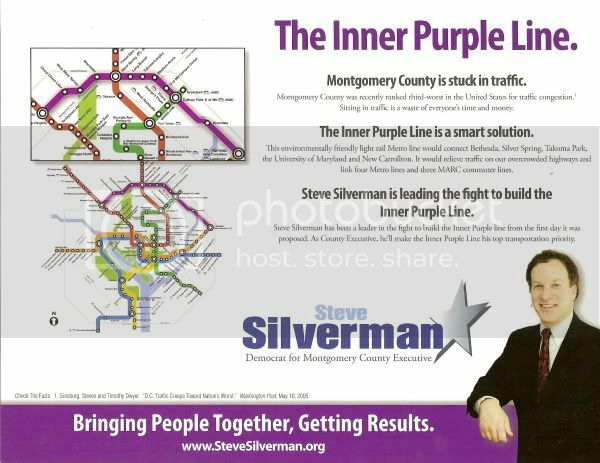 If you agree with the Purple Line, you could vote for Steve Silverman. If you don't, you don't vote for him. It makes the choosing easier. However, that's probably a bit too idealistic for politics, especially given the climate of this year's County elections. Just an FYI - the "guy running around the blogs today" (yeah he hit mine too) was from the Silverman campaign. Nothing wrong with that, but I get ticked off when people try to hide behind anonymous posts. I think the purple line needs to be heavy rail if it's eventualy going to loop around like that. Leggett's piece was 40% photographs pf himself, 20% white space and only 5% issues. Contrast with Van Hollen who ran a campaign for "people who care about issues." No wonder Legget doesn't want to debate opposing viewpoints. I hit the trashcan icon as soon as that post appeared.